I love it when pop-ups turn into permanent restaurants. Parts of Soho - especially Kingly Court and Kingly Street - feature permanent restaurants that I used for frequently feature as pop-ups, and now Bistro Mirey, the French Bistro from Gerald Mirey and Ko Ito, is opening in SW6. Bistro Mirey will have its soft opening on Friday 22nd December, then be open with slightly reduced hours over Christmas and New Year, until it closes for a day on 2nd January 2018, before opening fully the day after. Please go along to try Gerald & Ko's wonderful dishes and great hospitality! "Following a series of successful pop-up supper clubs, Chefs Gerald Mirey and Ko Ito open their first permanent bricks and mortar restaurant, Bistro Mirey in Fulham on Friday 12th January. For the past year, Mirey and Ito have collaborated on fusion dining experiences underpinned by classic French cuisine with Japanese flair delivering unique, global inspiration on the plates of London diners. With locations changing every few months and menus evolving almost weekly, the pair sated the city’s appetites at the likes of Islington’s Cuckoo N1 and more recently at The Charles Lamb. 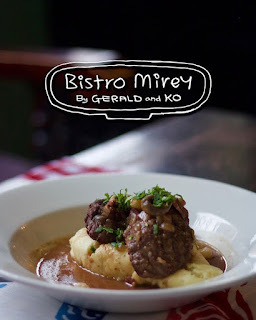 Bistro Mirey will deliver the same cosy, intimate and unique supper club experience, with the warm and memorable service they’ve become noted for. Both chefs believe that ingredients taste best when in season, so seasonality underpins every menu at Bistro Mirey. Serving lunch and dinner daily as well as weekend brunch and Sunday lunch, the menu is simple and authentic, filled with many locally-sourced ingredients from the local London markets. Starters include dishes of steak tartare, beetroot carpaccio and spiced potted shrimp whilst mains this winter run the gamut from Hokkaido-style pheasant with root veg and blueberry sauce, and braised beef cheek in red wine with miso and wasabi mash to polenta cake with shimeji mushroom and mizuna. For dessert, Mont Blanc with chestnut and traditional French galette sit alongside yuzu crème brûlée and matcha ice-cream. For wine, a selection of France’s most noted vineyards make up a hand-picked selection of blancs, rouges and rosés, which sits alongside a Japanese sake menu which also features local London craft sake Kanpai. Normandy-born and classically-trained, Gerald Mirey has been cooking classical French cuisine using the best British produce for two decades. Having worked at The Boisdale and The Garrison, Mirey was most recently Head Chef at Gordon Ramsay’s The Narrow restaurant. Ko, originally from Hokkaido Island - northernmost Japan - moved to the UK a decade ago and his cookery style fuses Japanese tradition with Western influence. For fusion cuisine with a unique twist, follow the path to Fulham and Bistro Mirey."